May 29, 2018 lowpricebooks 1118858107, Tax Law: Books, Thomas J. Kelleher Jr.
1118858107 – Smith, Currie and Hancock’s Common Sense Construction Law: A Practical Guide for the Construction Professional by Thomas J. Kelleher Jr.
Smith, Currie & Hancock’s Common Sense Construction Law is a guide for non-lawyers, presenting a practical introduction to the significant legal topics and questions affecting the construction industry. Now in its fifth edition, this useful guide has been updated to reflect the most current developments in the field, with new information on Public Private Partnerships, international construction projects, and more. Readers will find full guidance toward the new forms being produced by the AIA, AGC, and EJDC, including a full review, comparison to the old forms, areas of concern, and advice for transitioning to the new forms. The companion website features samples of these documents for ease of reference, and end of chapter summaries and checklists help readers make use of the concepts in practice. The updated instructor support material includes scenario exercises, sample curriculum, student problems, and notes highlighting the key points student responses should contain. Construction is one of the nation’s single largest industries, but its fractured nature and vast economic performance leave it heavily dependent upon construction law for proper functioning. This book is a plain-English guide to how state and federal law affects the business, with practical advice on avoiding disputes and liability. This book doesn’t cover legal theory or serve as a lawyer’s guide to case law and commentary – its strength is the clear, unaffected common-sense approach that caters to the construction professional’s perspective. 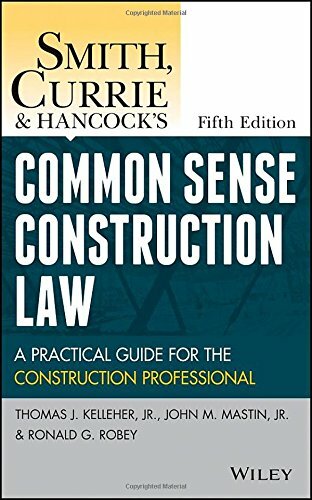 For a better understanding of construction law, Smith, Currie & Hancock’s Common Sense Construction Law is an efficient reference.